This flavorful balsamic marinade gives these pork chops fabulous flavor. 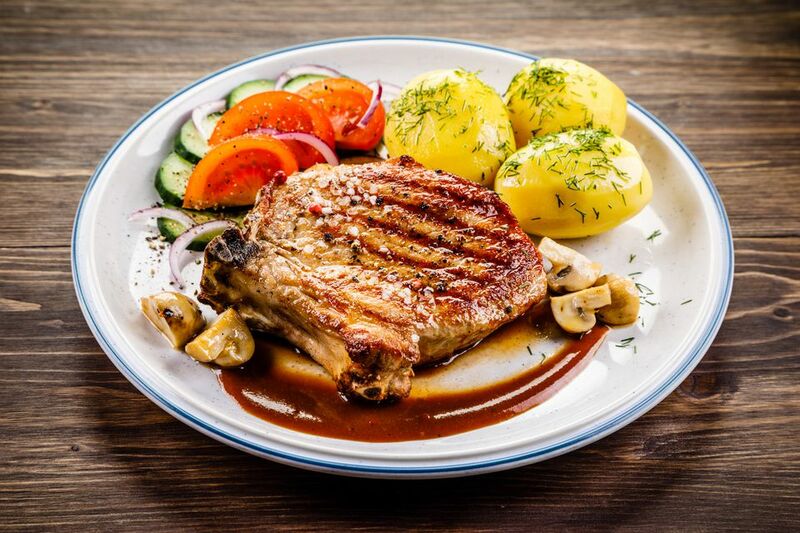 Use thick, bone-in pork chops for the best results, and marinate for at least 4 hours. Of course, marinades can vary and you can use a spicy rub or a soy sauce based marinade if you would prefer. In a blender, combine the vinegar, olive oil, mustard, brown sugar, pepper, garlic, rosemary, and green onions. Blend until smooth. Put the chops in a heavy-duty food storage bag or nonreactive container. Add the marinade mixture and turn to coat the pork thoroughly. Refrigerate for 4 to 8 hours. Remove the pork from the marinade. Discard the marinade. Heat the grill to a medium heat of about 375 F. Grill the pork over direct heat for about 2 to 3 minutes on each side to sear. Then move the pork chops to indirect heat and continue grilling until they are cooked through for about 15 minutes. They should register at least 145 F on a food thermometer.